The cake slice is approximately 7cm tall (not including the candle) and 13cm long. 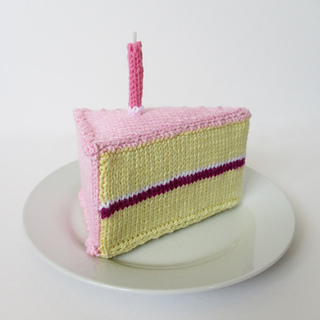 Oooh yummy, this cake is calorie free, and the pattern is free too! THE PATTERN INCLUDES: Row numbers for each step so you don’t lose your place, instructions for making the cake and candle, photos, a list of abbreviations and materials. The pattern is 3 pages and written in English. TECHNIQUES: All pieces are knitted flat (back and forth) on a pair of straight knitting needles. You will need to cast on and off, knit, purl, work increases and decreases, sew seams and knit stripes (i.e. change colour at the end of a row). 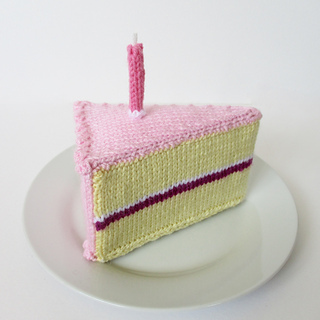 The pattern incorporates knitted bobbles for the icing, and instructions on how to knit a bobble are included in the pattern. The cake slice is made from four pieces which are sewn together so if you are not a fan of seaming, this may not be the pattern for you (but it is free so you could give it a try!). I have no objection if you wish to make these cakes to sell to raise funds for charity. However please do not reproduce or sell this pattern.